Characters can be imported from Eye of the Beholder II: The Legend of Darkmoon (see Import characters). Pre-packaged with DOSBox. 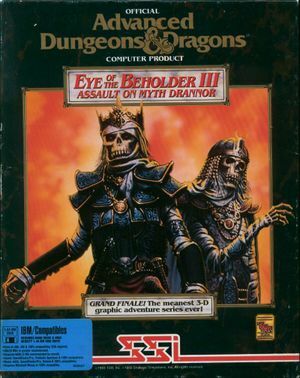 Bundled with Eye of the Beholder and Eye of the Beholder II: The Legend of Darkmoon. Characters can be imported from Eye of the Beholder II: The Legend of Darkmoon. The first four characters will be imported. Rearrange the party in Eye of the Beholder II if needed. Copy the Eye of the Beholder II EOBDATA*.SAV file into the Eye of the Beholder III installation folder. Rename the copied save file to TRANSFER.SAV. Run Eye of the Beholder III and choose Summon the Heroes of Darkmoon from the main menu. The All-Seeing Eye 3 is a program for Windows that adds a limited automapping capability when playing the DOS version in DOSBox. This page was last edited on 22 April 2019, at 13:07.